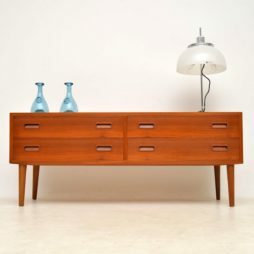 Mid-Century Furniture | Page 10 | Interior Boutiques – Antiques for sale and mid century modern furniture, french furniture, antique lighting, retro furniture and danish furniture. 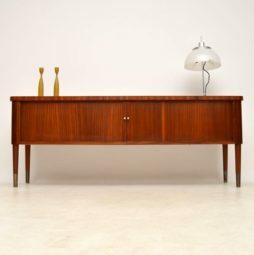 A beautiful and elegant vintage sideboard in Mahogany, this was made in Italy and it dates from the 1950-60’s. The quality is fantastic, it has amazing sliding tambour doors, brass handles and brass feet caps. We have had this stripped and re-polished to a very high standard, the condition is superb throughout. 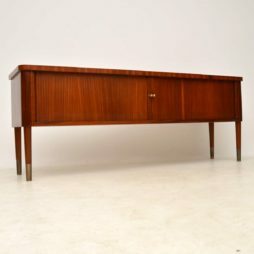 A stunning and rare vintage teak sideboard, this was made in Denmark and was designed by Poul Hundevad. 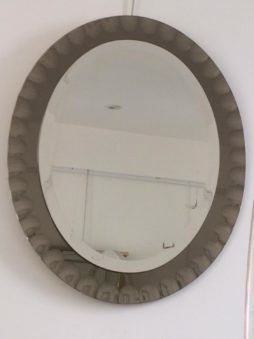 It dates from the 1960’s, we have had this stripped and re-polished to a very high standard, the condition is superb throughout. This is low, sleek and elegant while also providing lots of useful storage space. 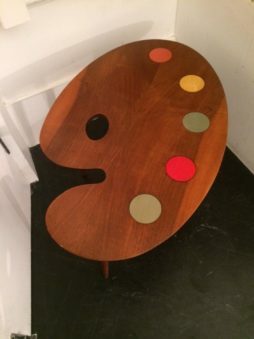 A vintage quirky and colourful coffee table, shaped as a paint palette, in teak wood and with splayed legs. 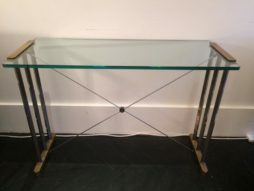 Glass top console table with brass sides and steel rod stretchers.. 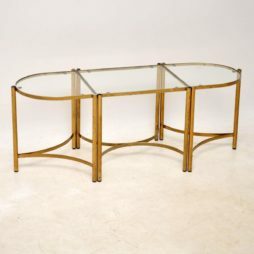 This piece is of exceptional quality and design, with a very thick glass top clamped between the side tops and with engraved details on sides and base. By German designer Peter Ghycz. Ca. 1970-80s. 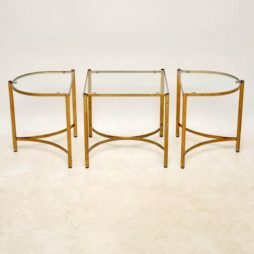 A stylish and very unusual set of brass tables, these date from around the 1960’s. This is comprised of three tables, one rectangular table and two ‘D’ shaped tables that sit either end of the middle table. They can be kept together or split up however you like, so they are very versatile. The condition is very good for their age, there is just some light surface wear to the brass. All is sturdy and sound, there are no chips to the clear glass tops. 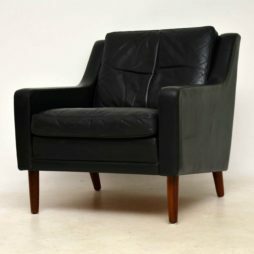 A stylish and extremely comfortable vintage danish leather armchair, this dates from the 1960’s. 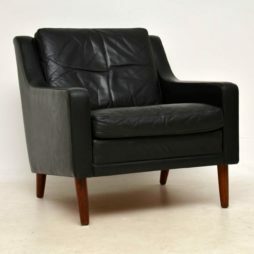 It’s in great vintage condition, the black leather is clean and has no rips or tears. 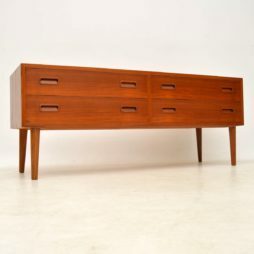 This sits on beautiful solid wood legs, and looks great from all angles. 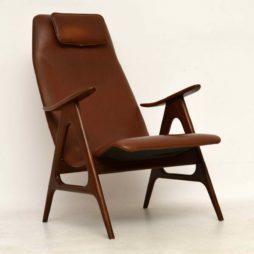 The seat is well sprung, there is no damage but with age the springs have got a little creaky, this doesn’t take away from the comfort of this fantastic armchair. 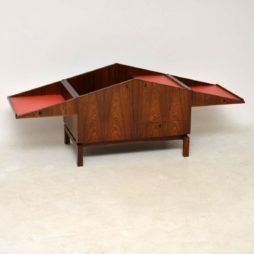 A stunning and extremely rare Danish vintage drinks cabinet, this dates from the 1960’s, it was designed by Leif Arling. The quality is superb, down to the very last detail. It flips open to reveal a red formica and wood lined serving area, complete with removable tray and bottle holder. This is in great original condition, with only some extremely minor wear here and there. The rosewood grains are phenomenal throughout, even on the inside of the cabinet and the inside of the drawer. The back is beautifully finished, this is designed to be free standing, and it looks amazing open and closed. 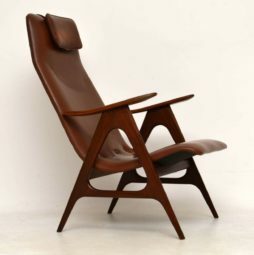 A stylish and very comfortable vintage armchair, this was made in Holland by Webe, it was designed by Louis Van Teeffelen. 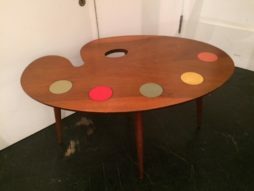 This dates from the 1950-60’s and it’s in excellent condition for its age. There is some minor wear to the brown vinyl here and there, overall its clean and intact with no rips or tears. The solid Afromosia frame is clean and sturdy, with some extremely minor surface wear. One of the back legs has a minor chip to the wood on the inside back, this is hardly noticeable and doesn’t affect the strength or stability of the chair, it’s seen in the images. 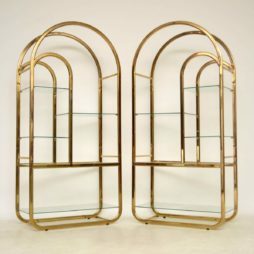 A stunning pair of vintage Italian brass cabinets, these date from the 1970’s. 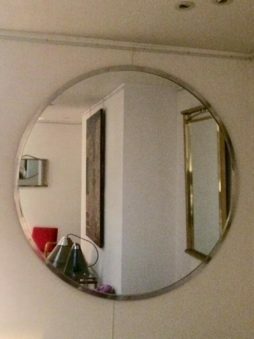 It’s rare to see a pair of these, they are most impressive. They’re in good vintage condition, the brass is a little worn and marked in places, adding lots of character. 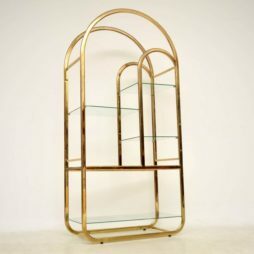 The brass plating on the upper arch of one cabinet has worn away slightly, but this can be placed against the wall. The clear glass shelves do have various small chips, most of them are right on the corners so aren’t visible when in place, a few of the shelves have very small chips along some of the side edges. These sit on small black feet that can be screwed and unscrewed to adjust the height by about 2cm. 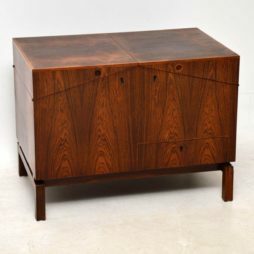 Mid Century Modern Design Rosewood Sofa table. 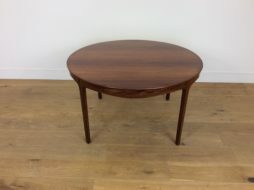 Beautiful Brazilian Rosewood Table with curved skirt, Designed by Ole Wanscher”s, made by A J Iversen.